How to insert signer fields? Writer lets you add different fields that has the data to be placed in your document. Before you get started, define the fields and determine the type of data to be entered into the respective fields. You can insert the following fields in your Writer document. Autofields: Use Autofields to display the date, page number, page count, etc., in your print out. Signature/Signer fields: These fields can be assigned to different signers during a sign workflow. Each signer will be assigned with fields including Signature, Initial, Company, Job Title, Date, Time, etc. This page explains how you can insert various fields in your Writer template and assign them to different users. If you want to display the current date, page number, page count, author name, document name and document version in your print out, this option can prove useful. Click where you want the autofield to appear. Click More > Insert >Autofields. Choose an autofield to be inserted. For example, if you want to add the current date, click on the date field. Make sure you place the cursor in the required place in your document before inserting the autofields. Click where you want the date to appear. Click More > Insert >Autofields > Date. The current date will be inserted. Click on the inserted date field if you want to manage the date settings. You can change the date format and choose to update the field automatically or manually. Signer fields will be assigned to specific signers during the Sign Workflow. For example, if you want to create a contract template and you require multiple signers to sign your documents electronically. All you need to do is to create a template in Writer and place the signature tags and fields in your document appropriately and assign each field to a particular signer. Each signer will be assigned with a Signature field and other related signer fields as required. Start by creating a new document template or open an existing template that is ready to add the signer fields. Click More > Insert > Sign and fillable fields > Signer fields. The Signer Fields panel will open. Start adding the required number of signers in your document. Note: You can add up to 10 signers. 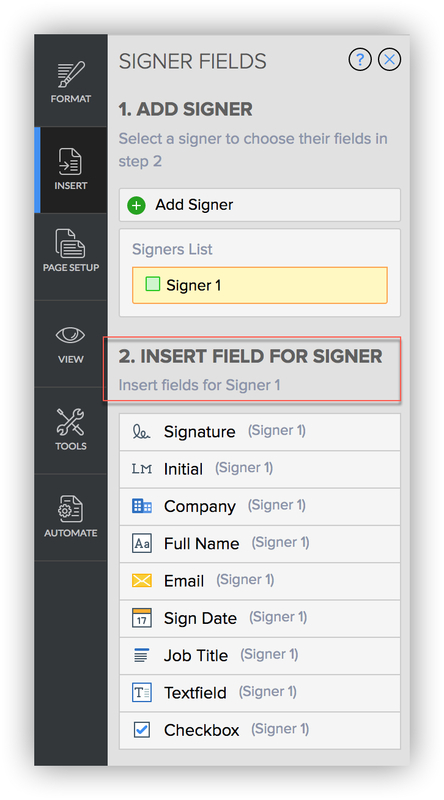 In the Signer Fields tab, you can add different sign fields to your document and assign it to each signer. Your template will be created with Signer fields. Once done, you can share the file to the respective signers. See also Sign Workflow process. Use fillable fields to make your document look like a pre-printed fillable form with necessary fields instead of looking like a paper with blank lines. To create a new fillable document in Writer, you need to start with a new template and then add the required fields. Writer encompasses the most popularly used fillable fields, including name, text boxes, drop down lists, email, phone, date, percent, currency, select boxes, and check boxes. Creating a document with fillable fields begins with just a few basic steps. See below. Start with a new document and insert fillable fields. Click More > Insert > Sign and fillable fields > Fillable fields. The Fillable Fields panel will open. Add the required fields in your template. Whenever you insert a fillable field, the corresponding fields properties panel will open. You can change the settings of each field here. Also, you can set the required fields to Read Only mode as required. You can insert a fillable field and link it with another field. Linking fields help to fill the related data anywhere in your document automatically. You need to configure same tag name to the fields that has to be linked in multiple places. Click on any field in the template. In the field properties panel, enter a unique label name to your field and hit Enter. For example, you have username field that repeats multiple times in your template. You can link each field with the same label name. 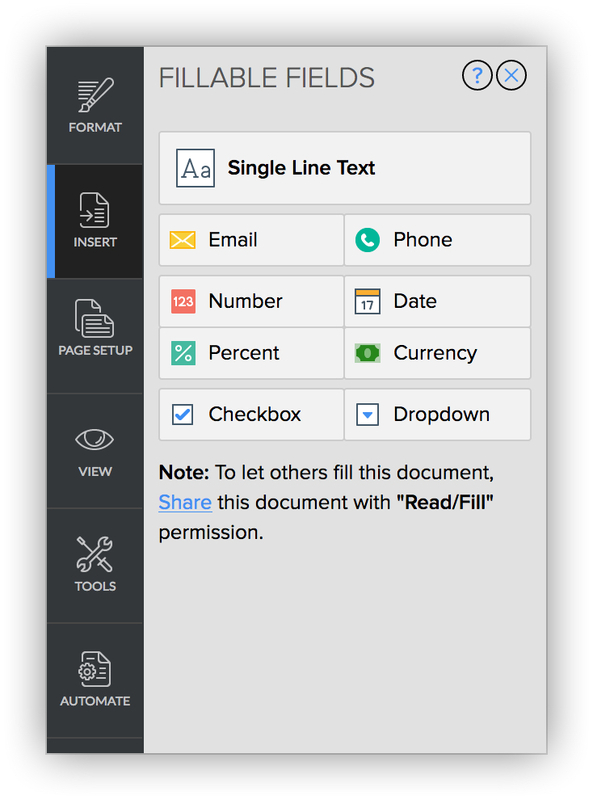 Now share your document in Read/Fill mode to your collaborators. Whenever the collaborator fills in the username field, the remaining fields with the same tag name will be filled automatically, thus saving your time. 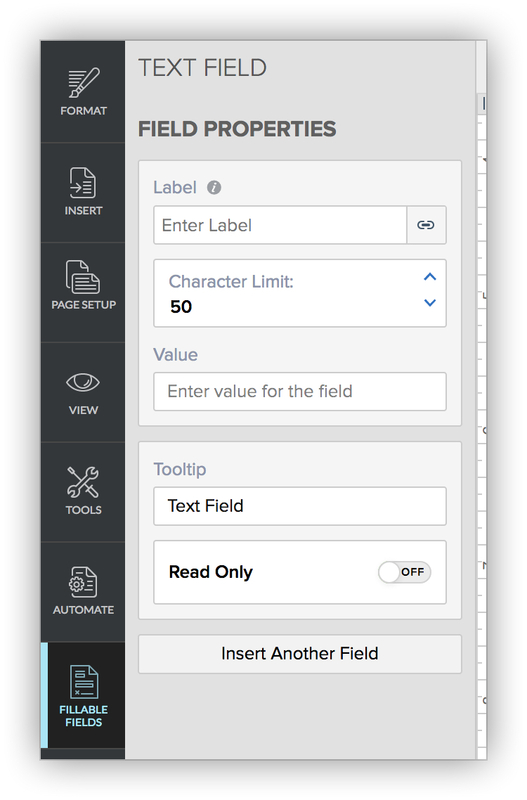 If you want to control how much others can edit a field in your document, you can use the Read Only mode option. Click on any fillable field in your document. The corresponding Field Properties panel will open. Enable the Read Only mode button for that field.